Uranus is a cold and distant world that hasn't been seen up close for 25 years. British scientists propose a plan to launch a satellite in that could shed new light on the mysteries of the frozen planet. The seventh planet in the solar system and the third largest, Uranus was first discovered in 1781 by Sir William Herschel from Bath, England. Largely comprised of ice and rock, Uranus has the coldest atmosphere of any planet in the solar system, with brutal 500 mile-per-hour winds racing across its surface. It's been a long time since we've gotten up-close and personal with Uranus. The last good look was back in 1986, when the NASA's Voyager 2 probed passed close to the planet on its way out of the solar system. 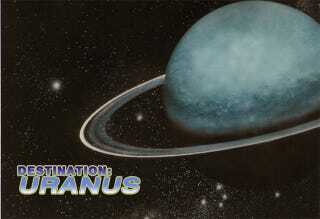 Because of this lack of familiarity, scientists have many unanswered questions regarding Uranus. Why does it give off so little heat? Why is it tilted on its side, rolling about the solar system like a ball, causing half of the planet to face away from the sun for 42 years at a time? The Uranus Pathfinder Project wants those questions answered. Backed by more than 160 scientists and headed by Dr. Chris Arridge of University College London's Mullard Space Science Laboratory, the Pathfinder Project is dedicated to developing a plausible mission concept for sending a probe on a 15-year journey to the distant planet. Dr. Arridge explained to Skymania.com why this mission is so important. "We've only really scratched the surface of Uranus. It is very difficult to observe from Earth because any detail is smeared out. Since Voyager flew by we know the rings and atmosphere have changed. We need close-up measurements. Uranus is ripe for learning a lot from. It is so different among the planets." To reach their lofty goal, the project has submitted a proposal to the European Space Agency, detailing a £400 million (roughly $630 million USD) joint project with NASA to launch a probe into orbit around Uranus. The nuclear-powered craft would be launched in 2021 and would slingshot past other planets to build up speed, shortening the trip to a mere decade and a half. Once in place the probe would enter Uranus' orbit in order to study the planet, its five moons, and the various bits of debris surrounding them. The price tag may seem large, but to the European Science Agency this would be a medium scale mission, and one that Dr. Arridge says would make up its cost and then some in science. "We see this as medium scale only in terms of price. For the amount of science you get back it is a large scale mission for quite low cost." It remains to be seen if the ESA and NASA are willing to pay $630 million to look at Uranus.